This week we have taken an up close and personal look at each of the three winning playhouse entries and the designer behind them. Today, we are looking at “The Reading Room” Playhouse designed by Tyler Murph, who actually lives here in Dallas, Texas (same as me!) but surprisingly, we have never met one another before. Today is the final day where we are featuring the individuals who entered the 2015 Life of an Architect Playhouse Design Competition and had their playhouse selected from hundreds of spectacular entries submitted for consideration. Bio: Born and raised Dallasite, practicing architecture/design for 16 years, University of Texas at Arlington graduate, doing higher education work now but have done corporate, K-12, multifamily, and religious architecture. Musician in my spare time, and secretly wish I was doing modern residential (…or not so secretly). Surprise me with Something: I can clap with one hand. No really…I can. Are you currently working and if so, what type of work do you focus on? 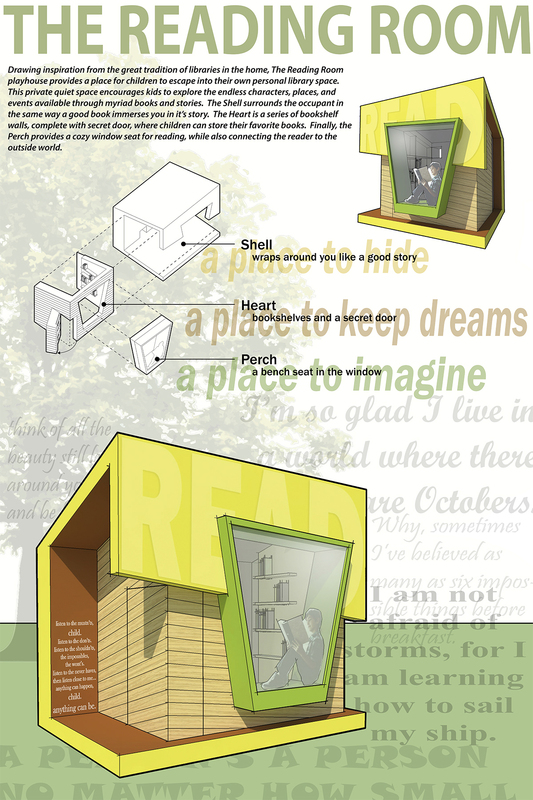 What lead you to enter the Life of an Architect Playhouse Competition? A fun competition that could be done in a reasonable amount of time and also supports an incredibly important cause! How long did you work on your design? Three or four days for design, maybe. Probably a week for construction documents. What software did you use to create your submission board? Was there one aspect of the design requirements that you felt was particularly challenging? Probably just thinking about something that fits inside an 8 foot cube…very different than what I’m used to. Scaling formal ideas down to that size isn’t as easy as you might think. Then thinking through how to build it so I could document it for the contractor was much more challenging than I had anticipated. Was this design problem more challenging that you anticipated? …oops, see above. Yes it was! Have you ever designed a playhouse or similar small project like this before? Nope…but I have a feeling it wont be my last. How do you feel about having your playhouse be built for charity? Toying around with the idea that some grown ups have libraries in their homes, and that it might be fun for kids to have a similar space of their own where they can be in charge and enjoy reading in their own dedicated space…. NO PARENTS ALLOWED! Will you be coming to town to see it while on display? I live here, so yes, definitely! Do you enter competitions with regularity? I try to do something every so often, depending on my work load at the time. This was Tyler’s winning entry board – clean, easy to read, and evocative. This particular playhouse stood out for the judges – particularly the children on the panel. This was the sort of playhouse that was an actual building – a space to call your own – a fact that was not lost on the younger judges. Normally, this is the time when I show you a bunch of construction process photos … but I don’t have any. Since the designer of this playhouse – Tyler Murph – was local, the plan was that he would run point on the process; which he did – I didn’t receive a single question on this playhouse, Tyler handled everything. Since these playhouses tend to come together fast, between my travel schedule and Tyler’s work schedule, this playhouse came together so fast, neither of us was able to take any progress photos. This is ‘The Reading Room’, which pretty much looks exactly like the submission board – which is really no small feat to accomplish. Once you start adding real materials and structural members – not to mention that sometimes “value engineering” needs to take place to keep these playhouses in budget – slight revisions are sometimes needed to the adjust the original concept and make it a viable playhouse. Maybe I shouldn’t be surprised, all the entries, from every year, have always fared quite well as they journeyed from concept to executed product. I should also point out that this was the third year that Austin Commercial has built on of my competition winning playhouses and both times they have done an amazing job. Austin Commercial is a large construction company with offices around the country – but you would never know it based on how engaged they are in this community. I am incredibly grateful that they have stepped in to this process; I wish more large commercial construction companies were as willing to participate and contribute their skills and resources to an incredibly worthy cause.